The Evanston History Center was proud to participate in bringing the Chicago Architecture Foundation’s annual festival of great architecture, Open House Chicago, to Evanston again this year. The Evanston History Center joined thirteen other notable sites in Evanston in opening its doors to the public over one October weekend. The EHC has long been a supporter of the architecture of Evanston. Our annual Mother’s Day House Walk is in its fifth decade, bringing the best of Evanston’s historic residential architecture to the public. 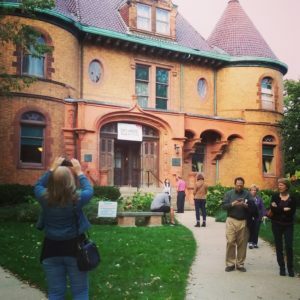 In addition to giving regular tours of the National Historic Landmark Dawes House, we also lead frequent architectural walking and bus tours of the neighborhoods and downtown. The EHC hosts exhibits and programming that include the impact of the local built environment on Evanston’s history. Our staff also give presentations at large on the architecture and history of local organizations. The Research Room and Archives at the Evanston History Center provide accurate and detailed records to anyone interested in the history of their building: from property owners and businesses to architects and builders, to writers and historians. We believe in the power of architecture to communicate, not just as an art form, but as the tangible story of a community’s shared cultural history. Over 2,000 visitors chose to make the Dawes House a stop on their weekend itinerary of notable architecture again this year. We were thrilled to see so many people come through our doors, and we look forward to many return visits, to see our new exhibits and programming, to host an event here, to bring friends and take a tour.